NBA TV will feature five live games in five days, beginning with the San Antonio Spurs and Kawhi Leonard visiting Western Conference rival Portland Trail Blazers and Damian Lillard, Sunday, Jan. 7, at 9 p.m. ET. 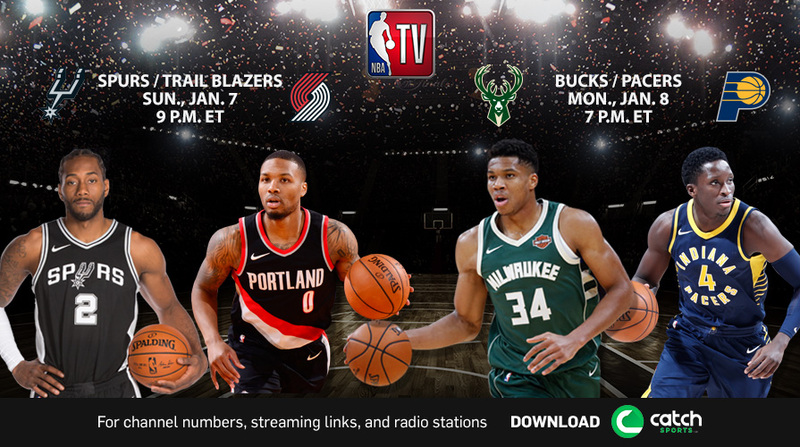 The network's live game coverage will continue with two of the Eastern Conference's youngest and most exciting playoff hopefuls when the Milwaukee Bucks and Giannis Antetokounmpo take on the Indiana Pacers and Victor Oladipo, Monday, Jan. 8, at 7 p.m.
NBA TV's penultimate Players Only telecast on Tuesday, Jan. 9, will feature a Western Conference doubleheader - the Trail Blazers and CJ McCollum vs. the Oklahoma City Thunder and Russell Westbrook at 8 p.m., followed by the Sacramento Kings and Buddy Hield visiting the Los Angeles Lakers and Brandon Ingram at 10:30 p.m. 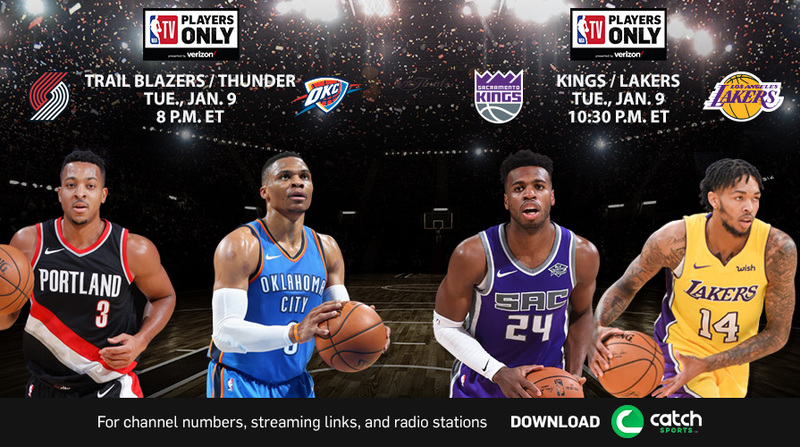 Following NBA TV's final Players Only telecast of the regular season on Jan. 16, the franchise will air on TNT, beginning Jan. 23. The network will televise its fifth game in five days - Boston Celtics and Kyrie Irving vs. Philadelphia 76ers and Ben Simmons - on Thursday, Jan. 11, at 3 p.m. from London. 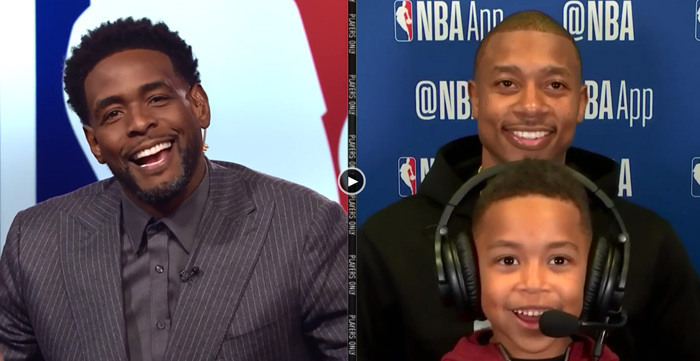 • NBA TV's new series – What If – will continue today, Thursday, Jan. 4, during NBA GameTime at 7:30 p.m. This week's feature will examine Robert Horry's game-winning shot in Game 4 of the 2002 Western Conference Finals and what would have changed for the Lakers and Kings if he hadn't made it. Commentary from Shaquille O'Neal, Kobe Bryant, Horry and Vlade Divac will be highlighted. What If featurettes will also available via NBA.com and social media. • High Tops: Plays of the Month, the network's monthly highlight show hosted by Ro Parrish will return with a look at December's best moments on Saturday, Jan. 6, at Noon. • NBA Inside Stuff will return with an all-new episode, Saturday, Jan. 6, at 6:30 p.m. Paul George of the Thunder goes fishing with a group of kids from Oklahoma City, while Andre Drummond of the Detroit Pistons surprises a team of Special Olympians. The Knicks' Doug McDermott and Lindsay Whalen of the WNBA's Minnesota Lynx will also be featured. • This week’s NBA TV Euroleague Game of the Week: FC Lassa vs. CSKA Moscow, on Sunday, January 7, at 3 p.m. Overall, the network will televise 12 Euroleague Games through the end of the season. • NBA TV will televise six live games from the NBA G League Showcase – Wednesday, Jan. 10 through Saturday, Jan. 13 – from Mississauga, Ontario, home of the Raptors 905. The NBA G League Showcase – whichaffords players and coaches the opportunity to display their skills in front of general managers and player personnel executives from all 30 NBA teams – will tip off with the Santa Cruz Warriors vs. Grand Rapids Drive on Wednesday, Jan. 10, at noon, followed by Austin Spurs vs. Windy City Bulls at 2:30 p.m.